Are you planning to take a vacation? Or perhaps you're like us and always out and about doing fun field trips or errands? Well you will like this list of FUN and FREE road schooling ideas. -Load your Kindle with FREE ebooks Free Homeschool Deals posts a huge list of FREE Kindle books every week. And if you don't have a Kindle device download the Free App for your cell phone, PC or tablet. -Load an MP3 player with audio books. You can get some great FREE audio books from this links: Books Should Be FREE, Homeschool Radio Shows, Internet Archive, Storynory. 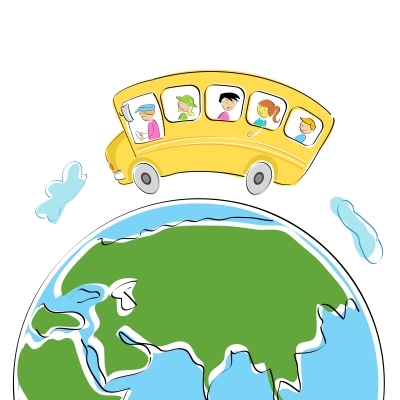 -Kids can also learn a lot about Geography while on the road. 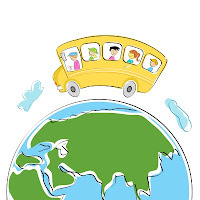 Here are a few ideas: Map Out The Road Trip, have your kids name the State Capitols or States, Play State Capitol Bingo, keep track of landmarks, cities etc on these great customizable maps, have your kids read the maps as you travel. -Play some fun games you know like the ones you played when you were a kid like "I'm going on a trip and I am bringing a ___." There are some great ideas on Squidoo. -Take turns telling stories. Here are some websites with story starter ideas: Classroom Jr, Homeschool Starter, School Express. -One of my favorite things is Mad Libs. Here are some Mad Lib websites with free printables and ideas: Classroom Jr, Mad Glibs. -Load up the MP3 player with FREE music. Download some classical music so the kids can learn about the great composers. Or just some educational songs about days of the week, weather, ABC's and 123's. You can get some great FREE music from these links: Dream English, Free ABC Songs, Free Kids Music, Amazon Free Kids Music Samplers. -Print or make some scavenger hunts - There are lots of FREE ideas on the internet here are few. Moms Mini Van this website also has lots of other great ideas so make sure you take some time to search her website. Moms Mini Van also has one for Pre-School age kids. Family Fun has great list which you can type up in your own form. Here is a fun photo road trip challenge you can join in just give them a camera and let them have fun. Here are a couple of others Free Puzzles, Car Brand Search, Spot the License Plate. -Car Bingo can always be fun. Here are some ideas: Moms Mini Van printable, We Just Got Back printable, Family Fun printable. There is one cool idea using bubble wrap posted on my Pinterest Board. I plan to add more fun travel stuff to this board soon. -Practice Tongue Twisters I could see this being tons of fun here are some tongue twister websites: Twister King, Fun With Words, Zo Zanga. -Print up some fun printables like these: Highlights Hidden Pictures, Car and Truck Coloring Pages (have the kids color the vehicle as they see them on the trip and maybe even count how many times they see each type of vehicle), Tic Tac Toe and Hangman, Road Trip Word Scramble, Customized Word Searches, License Letters, Highway Alphabet Soup, Travel Detour. -And you can always take along the laptop for some online learning. -There is 3 days left to enter to win 1 of 3 Rose Art 3D Create 'N' Color Imagination Stations. Michaels Passport To Imagination. These are always so much fun. Hopefully tomorrow we are going to Michales between 6pm-8pm to make the duct tape wallet for Ben for Fathers Day. He loves duct tape wallets and one made by the kids will be really cool. Most of the time they are FREE but there are times you may need to make a small purchase. Be sure to also check out the cute craft ideas like this Flip Flop Journal. Left: A review will be coming on this eventually. 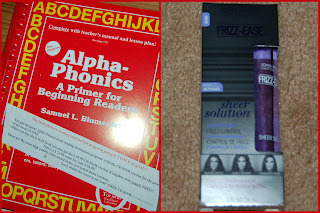 Right: Frizz Ease samples I get lots of great FREE stuff through a website called Bzz Agent check it out.